25 February, 2018, Cairo, Egypt: Opportunities to invest in Egypt’s real estate market will take centre stage at next month’s 7th edition of Cityscape Egypt, especially as momentum builds behind new and existing projects from Egypt’s major developers. For real estate developers and investors looking at Egypt this year, 2018 signals a return to a more stable market. According to Oxford Business Group, the country’s improved performance in key sectors, tighter fiscal management and increased capital inflows drove a much-needed economic rebound last year, with growth expected to accelerate further this year. The country also got the stamp of approval from the International Monetary Fund (IMF), who declared earlier this year that Egypt's economic outlook is favourable, following the completion of its second review of the country's reform programme. “At this year’s 7th edition of Cityscape Egypt, we expect to see developers being more competitive as they respond with a wave of new and flexible, attractive plans following renewed interest in the market from both investors and homebuyers and a positive economic outlook,” said Chris Speller, Exhibition Director at Cityscape Egypt. “While 2017 was a challenging year for the country, last year’s Cityscape Egypt attracted a record-breaking number of visitors in what was the largest event in the show’s history. With a 25% increase in visitor numbers compared to 2016. In addition, Cityscape Egypt grew close to 10% selling out all halls. The massive uptake in visitor numbers revealed the appetite for residential real estate from Egyptians, even in the most challenging of times. We expect the same vigour from developers and visitors this year especially as stability returns,” added Speller. Taking place at its new venue, the Egypt International Exhibition Centre (EIEC) in Mehwar Almosheer Tantawy in New Cairo from the 28th until the 31st March, Cityscape Egypt 2018 includes 20,000sqm of exhibition space and over 70 exhibitors, with the figure likely to climb as the show approaches. Among the strategies which will be used to attract sales in an increasingly competitive market this year, according to a recent research report by JLL, are extended payment plans and improved community facilities as developers seek to offer more value for money. Community creation has also become a means of creating a competitive edge to target those consumers seeking to maintain a dynamic lifestyle. It’s the reason why many developers will showcase projects that emphasise the ‘live, shop, play’ concept. “It is basically the ability to provide all their (homebuyers) needs at a reasonable and affordable price – this is key especially after the devaluation,” says the property consultant. This year’s platinum sponsor, PROJECTS, will be showcasing its Blues Tiffany development, in Ras El-Hekma on Egypt’s North Coast. The project emphasises the ‘live, shop, play’ concept and is spread over 250 acres. The developer will be offering a 10% discount and will be revealing flexible payment structures at the show. Also, exhibiting this year is Porto Vacation Club who will showcase a range of its seaside accommodation which will be offered with flexible payments plans. 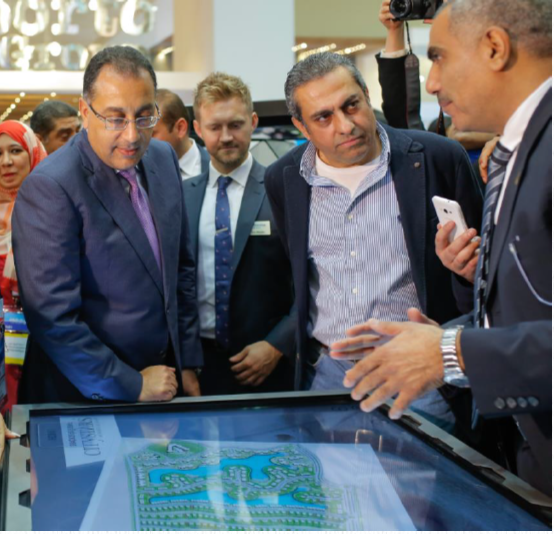 “We believe the current real estate market is buoyant and optimistic, which is why we are always looking to create new opportunities for our members to become part of the real estate industry,” says the exhibitor on its participation at this year’s Cityscape Egypt. New to this year’s show are two dedicated days of the Cityscape Egypt Conference, taking place at the Four Seasons Nile Plaza on the 12th and 13th March – two weeks before the exhibition kicks off. The Conference includes a stellar line-up of speakers and topics based on market research and the guidance of the Advisory Board. Also, returning to the Four Seasons Nile Plaza on the 13th is the Cityscape Awards for Real Estate in Egypt, which celebrates excellence in real estate development, architecture and forward-thinking leaders. The shortlist has been revealed and this year will see some of Egypt’s notable developers and architects vie for the coveted award in each of the eight categories. Contending for the Commercial Project Award are the projects: Palm Central, Zayed Edge, The Lane, Alburouj Smart Village East and Alex Bank HQ. While Forty West, Hyde Park New Cairo, Park Views, Project 1, and Stone Park have all been shortlisted for the Residential – Low to Medium Project Award – Built. Going head-to-head for the Retail Project Award are Rivette, Sidewalk, The Alma, and The Yard Mall. Visitors to the exhibition will also have the opportunity to attend the brand-new Cityscape Egypt Talks. These free-to-attend, educational sessions held on the show floor, will feature a range of experts who will discuss and provide attendees with the necessary information on investing in properties, regional market trends, investment hotspots, financing, and banking solutions. Exhibitors at this year’s Cityscape Egypt include: Aristo Developers, Ardic for Real Estate Development, Edge Architects, Madaar Development, Misr Italia Properties, Mousa Coast Development, Tatweer Misr, SODIC, and many more.